As Netanyahu meets with Brazil's President elect- Bolsonaro, senior official says the nation will move embassy imminently. A senior diplomatic official said that "it is a matter of time" until Brazilian President-elect Jair Bolsonaro fulfills his promise to transfer his nation's embassy to Jerusalem. Trump had promised all throughout his campaign to move the US Embassy to Jerusalem but only decided to officially transfer it to Israel's capital in May 2018. 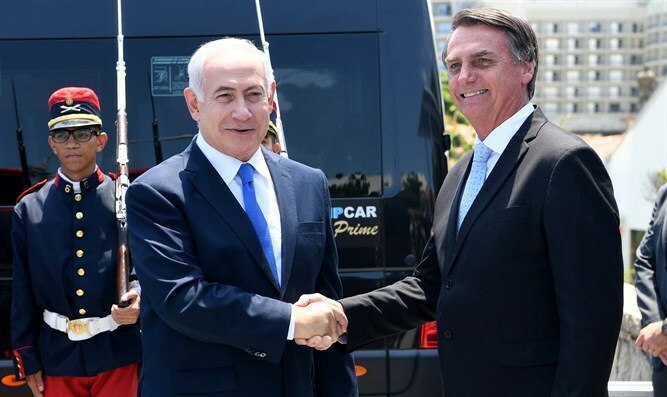 The statement comes as Prime Minister Netanyahu met with Bolsonaro in Brazil on Friday ahead of his inauguration as Brazil’s new president on January 1 in the country’s capital city, Brasilia.